Outdated fuel tanks can be a persistent source of fuel contamination. Whether it is a metal tank corroding at the welds, a UV deteriorated outboard tank with rotten gaskets or an old fiberglass tank leeching resin into the fuel, sometimes the most effective way to rid a boat of fuel contamination problems is to replace the entire system. Choosing a tank does require some fundamental safety choices. ABYC standards (American Boat and Yacht Council) and Coast Guard regulations are the best resources for making these decisions. Poly fuel tanks are increasingly popular since they will not corrode or collect condensation like metal tanks. Marine fuel tanks are of two varieties, above deck and below deck. Inboard tanks, also referred to as below deck or permanent, need to pass permeability tests. This means explosive fuel vapors will not leech through tank walls. Polymers used must resist heat for fire safety and be compatible with the type of fuel used. On the opposite, outboard, or above deck tanks cannot be placed in enclosed compartments because they are permeable. Though they cost less, these topside fuel tanks pose a serious fire risk when stowed because vapors escape even when sealed tight, and therefore above deck tanks must be kept on deck. Moeller and Tempo offer a full line of ABYC certified marine fuel tanks. The best insurance protecting any engine, no matter its age, includes a seasonal inspection of the fuel system. Beyond simply following the fuel line route and inspecting for chafe and potential failure spots, track filter replacement frequency. A prudent practice is to date new filters with a permanent marker when installing, and examine the old filters before tossing them away. If filters clog frequently, despite attempts with fuel additives and fuel polishing, it may be time to consider updating the fuel system as a winter project. Fuel level monitoring can be made easier by integrating convenient dashboard display fuel gauges. Select from a full array of fuel gauges and sending units from Teleflex, Sierra and Tempo. Alternatively, mechanical direct sight gauges for portable and permanent tanks offer a failsafe choice. Unlike automotive tanks, marine fuel tanks are required to have vents. 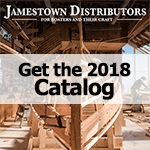 Jamestown carries fuel tank hardware for vent installation, including elbows, pipe thread to hose converters and the appropriate grade fuel line to achieve a professional installation. When selecting fuel fittings, be sure to maintain the ID (internal diameter) recommended for the engine throughout the delivery line.